During a recent pantry organization, I stumbled upon a forgotten jar of saffron honey. It made the trip home with us from Tuscany over a year ago. I was trying to come up with a delicious way to use it and I have always liked the honey and cornbread combination. This cornbread is light in your mouth, has a slight crunch from the coarse ground cornmeal, a touch of smokiness and the hint of sweet. Cornbread is one of those recipes where it seems everyone has their own way to do it. This is my healthy adaptation without butter or dairy. If you want to make this recipe vegan, swap the honey for agave and add a touch of ground saffron. This recipe is different from cornbread I have made previously and I definitely think this is my new favorite. The whole round of cornbread was eaten in less than 24 hours and only two of us were involved. We stumbled upon a small winery while driving through Tuscany last Spring. There are hundreds of vineyards but we sought out a small quiet place to stop and have lunch on our way to Florence. We lucked out by finding Corte di Valle and ate an al fresco lunch of the local olives, tomatoes, bread, olive oil and wine. We ended up bringing home a few bottles of their wine, olive oil and their saffron honey. The owners grew and harvested the saffron right on property. This delicious cornbread comes together quickly. All the dry ingredients are combined in a medium sized mixing bowl. 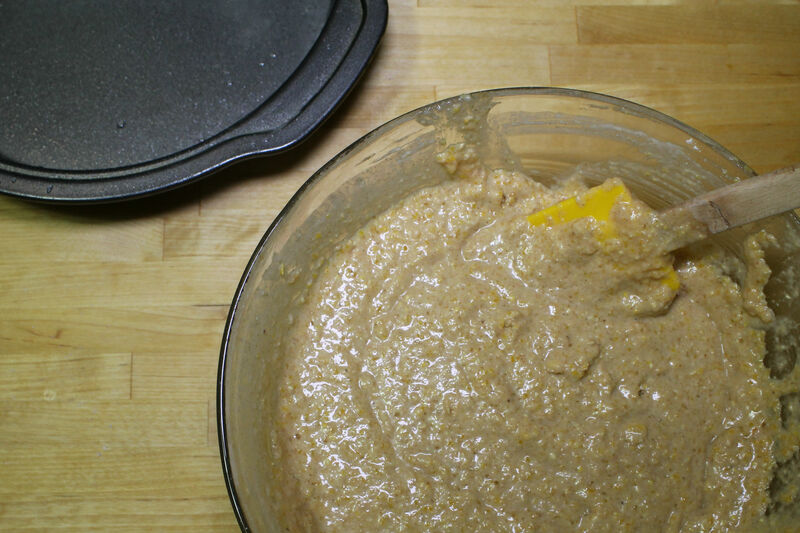 In a smaller bowl, the grapeseed oil, applesauce and non-dairy milk are whisked together. 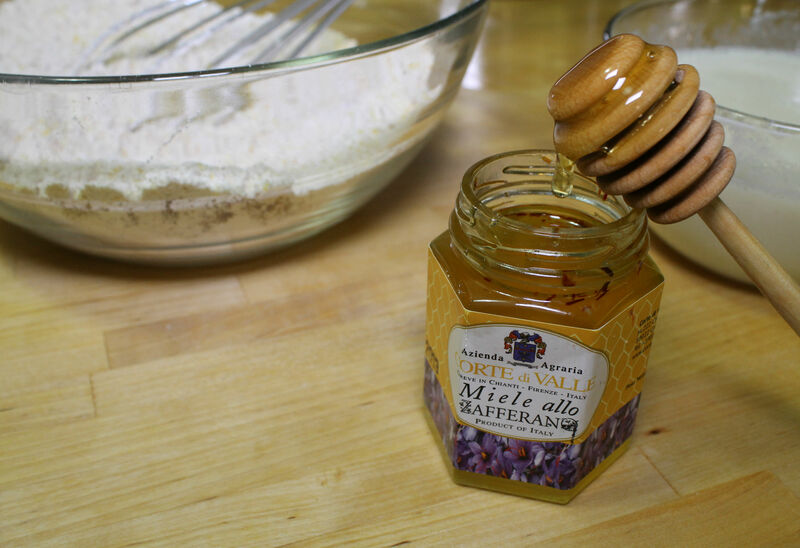 Once the liquid ingredients are added into the dry and combined, the saffron honey is gently folded into the batter. Pour into a greased 9″ pan and pop it in a 400 degree oven for 18 to 20 minutes. I used a round cake pan because I like cutting it into wedges but feel free to use a square baking pan. 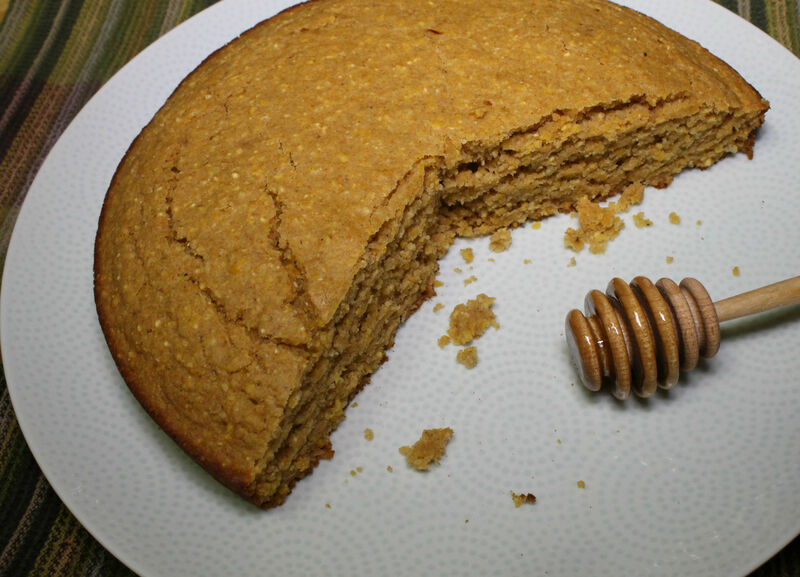 A delicious and healthy saffron honey cornbread with a hint of smoked paprika. 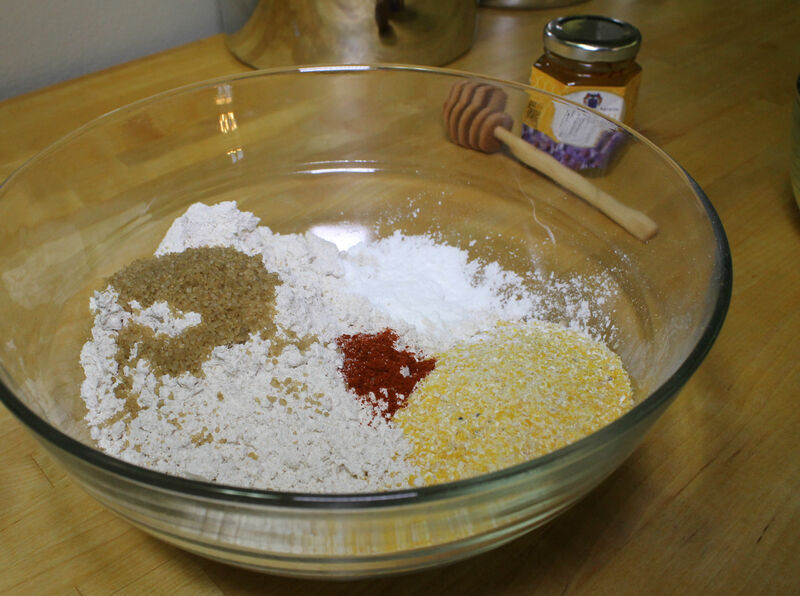 In a medium mixing bowl, combine the cornmeal, pastry flour, sugar, baking powder, salt and smoked paprika thoroughly. In a small mixing bowl, whisk the grapessed oil, applesauce and soymilk until well combined. Add the liquid ingredients into the medium mixing bowl and stir until just combined. Add the saffron honey to the batter and stir to incorporate. Pour into a 9" round or square pan. Bake for 18-20 minutes. Allow to cool in pan for 20 minutes before removing to finish cooling. * If you would like to make this recipe with regular honey it will still be delicious. You can add 1/2 tsp. of ground saffron to the recipe if you would like to replicate the saffron honey flavor. Vegan adaptation: swap the 2 Tbsp. of Saffron Honey for 3 Tbsp. of Agave and proceed with the same steps as above.